Note: This tutorial walks you through configuring and deploying ("activating") a sketch to make it part of your site policy. You must be an authenticated Enterprise user who has authorized access to the CFEngine Mission Portal console. CFEngine must be up and running in order to complete this tutorial. A sketch defines data-driven configurable and reusable policy. You can use sketches to implement, activate, or enforce policy. 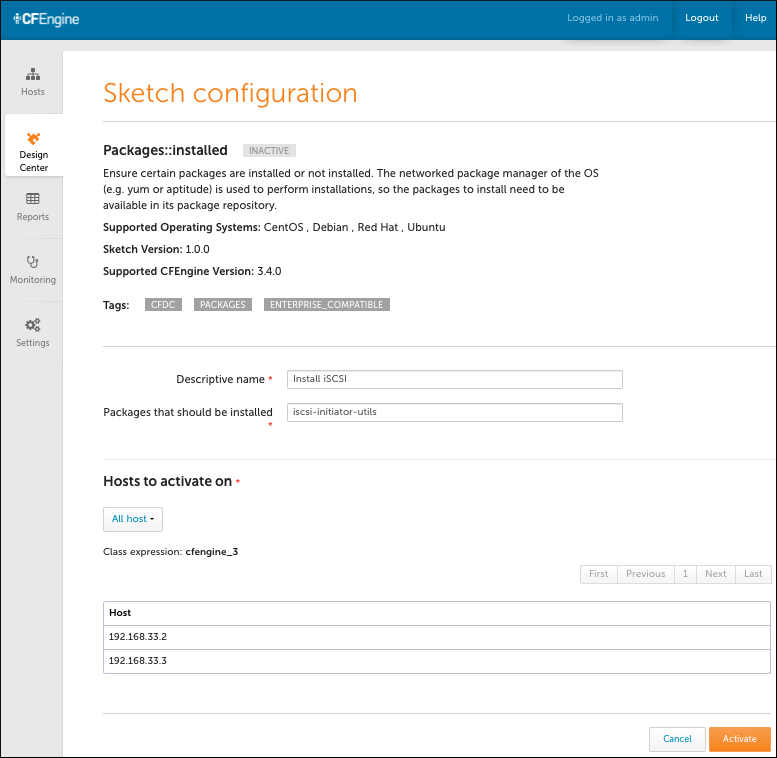 Sketches are written in the CFEngine policy language; you can use them simply by installing them, configuring them using the appropriate parameters and environments, and then deploying them on your infrastructure ("activating" them). The iscsi-initatior-utils software package must be present/installed on all hosts. Log in to the Mission Portal. Select Design Center from the left sidebar. a. Descriptive name: Enter Install iSCSI. This allows you to recognize the activation (and its goal) later, as the Design Center uses this name when it commits changes to Git. b. Packages that should be installed: Fill in the name of the package that must be installed. For this example, use iscsi-initiator-utils. This is the parameter set. c. Hosts to activate on: Click Select category to display host options. Select All hosts for our example. All host names appear. This is the environment in which the sketch must be activate. Click Activate. This deploys the sketch to all hosts. Enter a description in the Commit your changes window that appears. The Design Center uses this comment for version control when it commits changes to Git. Click Commit to complete the change. The policy that is generated when the sketch is activated gets committed to your Git repository. This allows you to keep track of who has made what changes, and when, and why. The policy server is typically configured to check the Git repository every five minutes to ensure that it is running the latest version of available policies. This process can be handled manually as well. The hosts check with the policy server for updated policy. They also work on default intervals of five minutes. The policy server collects information from the agents on the hosts to obtain insight into the progress with executing the sketch. The information it collects is used to update the information in the Design Center. 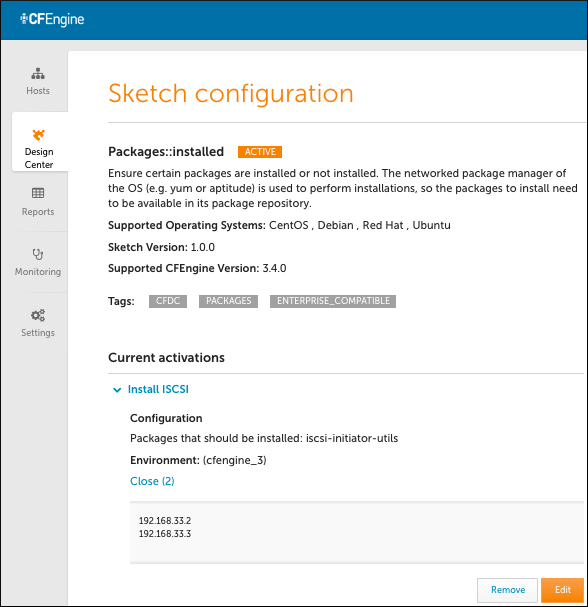 Now that the sketch is deployed, CFEngine continuously verifies that it is maintained. It checks 365 days per year, 24 hours per day, 12 times per hour to make certain this package is on all of the hosts. If the package is removed, it is added within five minutes, and CFEngine creates reports that it made a repair. Thus, the state of the overall system is known and stable and system drift is avoided. This works for 2, 200, or 20,000 servers.